But I can guarantee you your pup will love these cookies. And just to be sure you know, I'll remove the icing from these before Tanner and Oliver chow on them. Sugar for dogs--ack! What's more, they're incredibly, edibly healthy for Fido. The cookie on the left is a Chicken and Carrot Combo; can you see the orange specs of grated carrot? 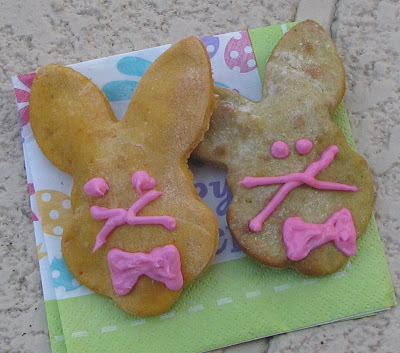 The cookie on the right was made when we did the St. Patrick's Day Chicken and Green Bean Shamrocks; it was our test bunny or lab rabbit--giggle. Cut the chicken breasts in 3 or 4 pieces each, and boil until cooked through. Add the carrots at the very end, to cook till tender. Because they are grated, this will only take a couple of minutes. Drain and allow to cool to a comfortable handling temperature. Preheat the oven to 350 degrees and grease two cookie sheets. Toss the drained and cooled chicken and carrots into your food processor with one-half the broth. Mix until fairly well ground. Add the eggs when almost ready. Mix until its consistency is like baby food. Scrape mixture into another container while you switch to your dough blade. Replace the chicken mixture and add a cup of the flour. Mix briefly. Add the remainder slowly until all is evenly textured as a stiff cookie dough would normally be. Adjust the stiffness for a good rolling texture by adding more or less broth, if needed. If it is sticky, add a bit more flour. It it is too dry to roll, add more broth. Remove the dough to a floured surface. Knead for a few minutes. Roll a ball of the dough out to 1/4-inch thickness. Using cookie cutters, biscuit cutters, or small juice glasses, cut and remove cookies to cookie sheets. Cool completely before refrigerating in a sealed container. One container will be fine in your refrigerator for serving over the next week or two. Recipe makes 2-4 dozen, depending on the size of your cookie cutters. Small, dog biscuit sized treats will give you a large quantity to freeze for future use, or to share. 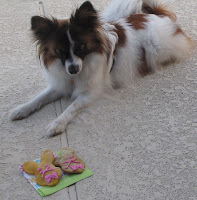 These cookies make a beautiful colored dough that is a pleasant looking treat your pups will find undeniably yummy. Be sure to keep them out of reach or they'll be gone faster than you can say "Peter Rabbit."